My first visit to this church was, in its way, an act of lunacy. I was taking part in the Historic Churches bike ride in 1998, trying to raise money for charity by visiting as many churches as possible in one day. 1998 will be remembered by veteran Historic cyclists as The Year It Rained, almost an inch of the stuff falling during the course of the day. It was now nearly four o'clock, and this was church number 63; by now, they had all begun to blur somewhat. This was exactly the right word, actually, because I was soaked to the skin; no, beyond that. Parts of me I'd only read about in books were wet. The kind lady on duty was a mite concerned. "You're very wet, dear", she observed. "Yes", I said, surveying the church dimly through bedraggled eyelashes. 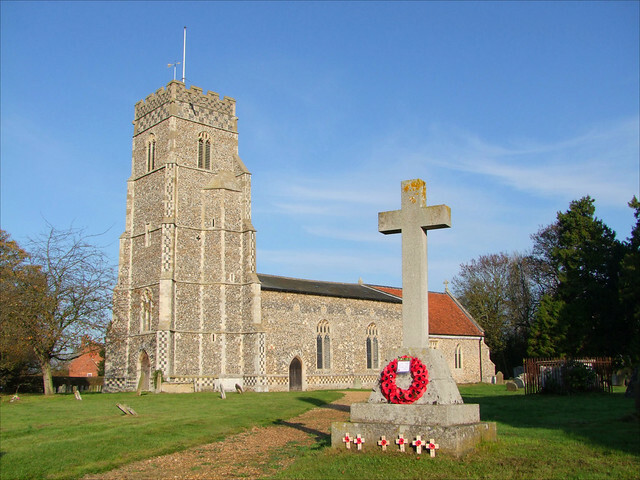 She stamped my form, which was rapidly dissolving across her table, and I headed on in grim determination to the pleasures of Wickham Market and Framlingham. It was a pleasure to come back on a bright, sunny day in 2011, albeit towards the end of November. St Peter and St Paul sits in fine juxtaposition to the village pub; a very sensible arrangement on the part of our medieval forebears, I always think. From across the wide graveyard you look to the south side of the church with its good 15th century tower, and the curiously high nave walls. For some reason, a clerestory was built and then filled in. Perhaps they changed their minds, or possibly it was blocked to keep the heat in. The chancel arch is stencilled with a text in the manner of that at All Saints at nearby Wickham Market, and a number of medieval features survived the extensive Victorianisation here. In the south side of the nave, there are the remains of an image niche in the jamb of a window, with the very top of what appears to be a piscina arch surviving to the east of it. Curiously, there are two more piscinas either side of the chancel arch. Up in the entirely 19th century chancel, a super 14th century angle piscina was rescued, and reset. There is a Table of Fees similar to the one at nearby Rendlesham. What I haven't seen, but find fascinating, are the Pettistree bells. There are six of them, and three of them are medieval. The story goes that, having remained silent throughout the Second World War, they were rung in celebration of victory on May 8th 1945, and appeared to make cracks in the tower. And so they remained silent, until everything was restored in the late 1980s. Two of the medieval bells bear Latin inscriptions invoking the help of St Nicholas and St John, but the third says Me Clamante Ihesu Maneat Bethleem Sine Lectu. This seems to mean 'While I ring out, let there remain a bed in Bethlehem for Jesus'. Perhaps the donor of the bell was the keeper of the adjacent inn. Rather lovely, that.